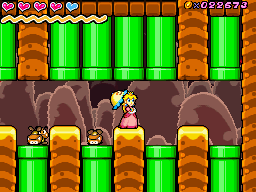 Fury Volcano 4-8 is the eighth level of Fury Volcano in Super Princess Peach. The level starts off with a platforming section, before getting to a balloon which needs to be used to get to an ! Switch, which destroys some stone statues. After this, the player will have to climb up, while avoiding fire. After this is another platforming section, before the Warp Pipe. The next room is filled with smoke, which can be dispersed with the Joy vibe, and at the end of the room is a Warp Pipe. The next room is filled with Warp Pipes, many of which spawn Goombas. The Warp Pipe in the middle leads to the Puzzle Piece, and the one at the end leads to the goal gate.